Ryobi's 18V ONE+ Compact Lithium-Ion Batteries work with over 50 ONE+ tools and offer superior performance compared to NiCad batteries. Providing 20% more runtime, Compact Lithium-Ion Batteries are 45% lighter weight when compared to the 18V NiCad Battery (P100), and they also provide fade-free power for maximum performance throughout the charge. Bosch Power Tools deliver stronger performance and lasting reliability. The Bosch 24618-01 impact wrench offers the most compact design for increased maneuverability in tight spaces and extended comfort. It comes with two FatPack Lithium-Ion advanced technology batteries that combines Electronic Cell Protection, a unique battery pack design and customized electronics to deliver optimal battery life and performance. Bosch 18V Batteries equipped with Coolpack Technology. This will provide better performance from your tools in extreme heats and frigid temperatures. Bosch Power Tools deliver stronger performance and lasting reliability. The Bosch IWH181-01 impact wrench offers the most compact design for increased maneuverability in tight spaces and extended comfort. It comes with two FatPack Lithium-Ion advanced technology batteries that combines Electronic Cell Protection, a unique battery pack design and customized electronics to deliver optimal battery life and performance. Bosch 18V Batteries equipped with Coolpack Technology. This will provide better performance from your tools in extreme heats and frigid temperatures. The Milwaukee M12 FUEL 5/8 SDS Plus Rotary Hammer Kit provides up to 2X more runtime, up to 75% more speed and the largest SDS Plus bit capacity in its class. Milwaukee has combined its exclusive POWERSTATE Brushless Motor, REDLITHIUM Battery Packs, and REDLINK PLUS Intelligence to deliver a 12V rotary hammer that rivals compact 18V tools on the market today. At only 10 long and 3.9 lbs, this tool provides performance and runtime that is comparable to a much larger tool, at a fraction of the size and weight. The electropneumatic design allows for drilling of up to 5/8 holes in concrete and masonry. For maximum versatility, regardless of application or orientation, the tool also features 2-mode operation, rotary hammer and hammer-only. The kit includes 1 M12 REDLITHIUM XC 4.0 Extended-Capacity Battery Pack, an M12 Lithium-ion Battery Charger, and plastic carrying case. 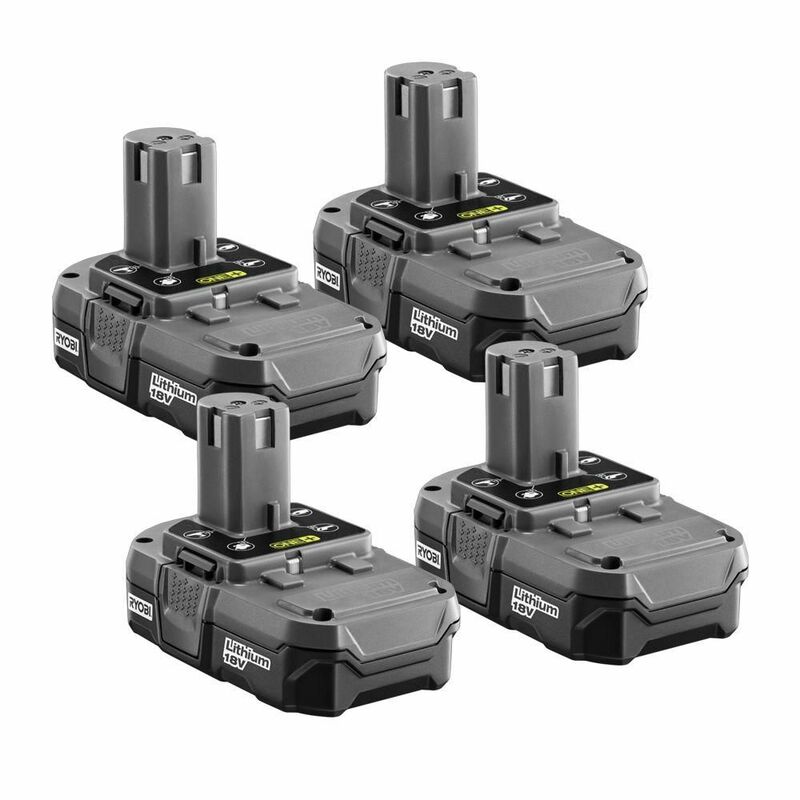 ONE+ 18V 1.3Ah Lithium-Ion Compact Battery Pack (4-Pack) Ryobi's 18V ONE+ Compact Lithium-Ion Batteries work with over 50 ONE+ tools and offer superior performance compared to NiCad batteries. Providing 20% more runtime, Compact Lithium-Ion Batteries are 45% lighter weight when compared to the 18V NiCad Battery (P100), and they also provide fade-free power for maximum performance throughout the charge. ONE+ 18V 1.3Ah Lithium-Ion Compact Battery Pack (4-Pack) is rated 4.4 out of 5 by 101. Rated 1 out of 5 by Rick from Great price. Terrible batteries. I bought this kit about 9 months ago and 2 of the 4 batteries are already junk. I'm getting rid of all of my Ryobi tools. Rated 5 out of 5 by kwbreton from GREAT PRICE! Needed to replace a few of my old 18V & when I saw this ad on TV - had to go for it! It was a great price for the 4. Rated 1 out of 5 by Othello712 from Poor Battery Life I have bought two packs in 2 years. Total of 8 batteries 7 are dead will not charge. Batteries stored inside and limited DIY usage. Use to rave about Ryobi and the One+ system. Went with One+ for compatibility across tools. Now regretting my decision/investment in my tools. Rated 5 out of 5 by 925DIY from A must have for RYOBI owners Such a good value for 4 batteries. If you are in the RYOBI platform already, this is a must-have. I've never had to stop working on a project because of batteries, and it works for all of my tools so I can switch very easily. If you're on the fence about investing in the ONE+ platform, this value should help answer the question for you. Can handle any project with my ONE+ tools. Rated 3 out of 5 by PawPaw from Disappointing for my Purposes Whereas these Ryobi batteries were not very good for the purpose I bought them for, they are actually a very good product. I bought them to use with a new 18v. string trimmer that I love, but in retrospect, I should have bought the hi-capacity lithium+ batteries so as to not have to stop and change batteries as often. I do however, own quite a few Ryobi 18v one+ tools, so these batteries will see plenty of use in my wood workshop. Rated 5 out of 5 by Michael from Ryobi stuff is great! Top quality batteries, quick charge, long lasting. Shipping was fast, well packaged, sales tax free. Rated 3 out of 5 by Victor from Good value Good good product, but really needed a new charger. This will be the third charger that I have bought in the past two years. Bad when batteries and chargers cost more than the original tool. Hi Steve, Unfortunately, you can't charge lithium batteries with a charger made for NiCad .